Hole-n-Wall » Blog Archive » Shaving Yaks…. I came across a reference to Yak Shaving recently and it has sort of stuck with me the last couple weeks when working on this project. Before going any further, please pop over to this definition. Did you read it? Good, now you can continue. Way back in November 2010 I won a bid on a Kenwood TKR-820 70cm repeater. I had been watching the auctions since reading about John-K7VE exploits setting up a garage D-Star repeater using non-Icom hardware. What John (and others) were doing was very interesting to me. I had never built a repeater, but here was a chance to learn about it. Plus there was the computer / networking angle, since the whole thing is really done with software running on a linux box, that really interested me. So following the eBay auction win, I started figuring out the pieces I would need. I bought a inexpensive set of cans from this Chinese company, which many people were using in non-RF sensitive locations. I start looking for the pieces to put together another rack mount PC to run linux and placed the order for the only item which was really single sourced, the node adaptor. (Of course in the months since there has been an explosion of alternative suppliers) In the end the node adapter I originally ordered took more then seven months to arrive and required a trip to Dayton to actually get. You see the individual I ordered the node adaptor from was having some issues producing the boards. First there was a lost PCB order and then parts weren’t available, etc. Along the way he stopped responding to e-mail from anybody who had ordered from him, but he was good to keep accepting new orders. I eventually was able to track him down at Dayton and asked him face to face where my node adaptor was. He really didn’t know, but took my card and promised to look into it when he got home. Later the next week I got an e-mail and he admitted to messing up and had ‘lost’ my order. He shipped the board the following week, right in time for me to be super busy at a new job and trying to get ready for Field Day. So this is long way of saying that following Field Day, I was ready to start building the repeater. So in my twisted head, I decided that the first thing I should do is get the location of the repeater ready. I didn’t want to put it in the shack due to the noise of the server. I also thought it would be nice to shorten the coax run to the tower. I decided that the laundry room would be the perfect place for a number of reasons. Our laundry room is located right inside the house, at the base of the tower, the laundry room stays several degrees cooler in there since its partly below ground level and there was a large unused corner where I could put everything. So the first thing I needed to-do to make this plan happen is run a network drop into the laundry room. 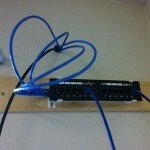 Since I was going to make a new Ethernet run, I might as well run CAT6 and move the house to GigE. (I had slowly started doing this anyhow, but only in my office where the servers use to live.) So to get the house moved over to GigE, I also needed to run CAT6 to the living room (every device around the TV requires Ethernet) and I might as well put a separate run into my wife’s desk. (She has been living with a long Ethernet cable running around the wall) Are you beginning to see how this thing started spinning out of control? Since I was going to have the entire house running through this new patch panel, I decided to spend the money and get a nice GigE switch. The important thing to me is that it has a 2Gig backplane. I got it installed shortly after getting the wiring done. While I was pulling CAT6 cable around the outside of the house, I decided I should also pull another TV cable coax drop in the laundry-datacenter. 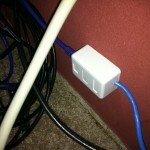 This would allow me to re-locate the cable modem into the same location as the D-Star server. Right now the cable modem is sitting under my workbench in the shack, because that is where the cable coax dropped was when we moved in. 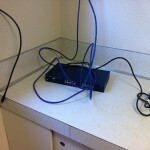 I had moved us to a commercial cable modem account when we dropped the satellite TV service. (We are now a 100% internet TV consumption house) Getting the cable modem by the D-Star box would make it easy to give it one of the static IP’s that we got with the service. This got me thinking that since the D-Star and cable modem would be in there, I might as well re-locate the main file server into the laundry-datacenter. But this was going to require some sort of rack, since there would be at least three servers, the cable modem, monitor/keyboard, repeater, etc. So once the switch / wiring was done, I started looking for rack ideas. I had fallen deep down the rabbit hole and I was still diggging…. But that will have to wait until next time….. This entry was posted on Saturday, August 27th, 2011 at 11:36 AM	and is filed under Uncategorized. You can follow any responses to this entry through the RSS 2.0 feed. Both comments and pings are currently closed.